1. Online In-Place upgrade: include no downtime for services, where you have more than one pool and you migrate users out of a pool, upgrade it, then migrate them back to it, and then upgrade the other Pool. 2. Offline In-Place upgrade: include planned downtime for the services, where you stop all Lync services, upgrade the pool, then start the services again (good for organization with only one pool). Also you would want to make sure your infrastructure is ready to host Skype for Business Server by a number of unspoken pre-requisites that is mentioned in my diagram. P.S it was mentioned that you should uninstall Lync management tools before upgrading to Skype for business nevertheless, I did not uninstall it, and used the steps I mentioned in my diagram and faced no problem related to this, so until I run into a problem because I did not uninstall the Lync management tools before upgrading, those steps are correct. 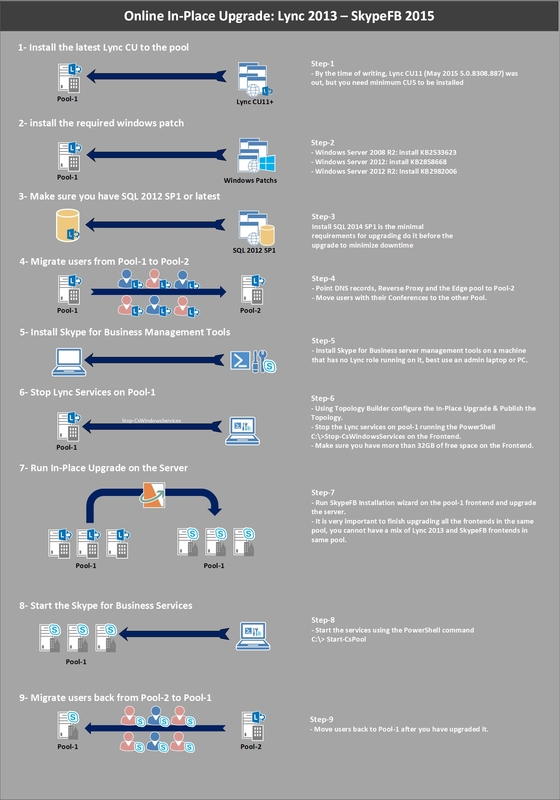 Following is a diagram I use with my clients to explain to them the In place upgrade steps that I will be doing on their Lync infrastructure. You can download in-place-upgrade in PDF format.